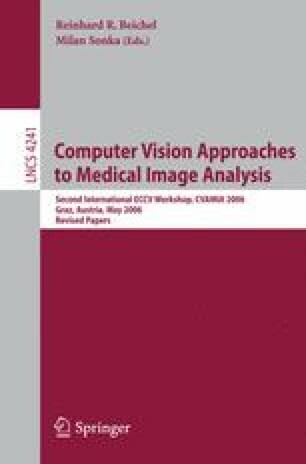 A computer-aided diagnosis (CAD) method is reported that allows the objective identification of subjects with connective tissue disorders from 3D aortic MR images using segmentation and independent component analysis (ICA). The first step to extend the model to 4D (3D + time) has also been taken. ICA is an effective tool for connective tissue disease detection in the presence of sparse data using prior knowledge to order the components, and the components can be inspected visually. 3D+time MR image data sets acquired from 31 normal and connective tissue disorder subjects at end-diastole (R-wave peak) and at 45% of the R-R interval were used to evaluate the performance of our method. The automated 3D segmentation result produced accurate aortic surfaces covering the aorta. The CAD method distinguished between normal and connective tissue disorder subjects with a classification accuracy of 93.5 %.